Working on somebody’s garden or in my own garden. 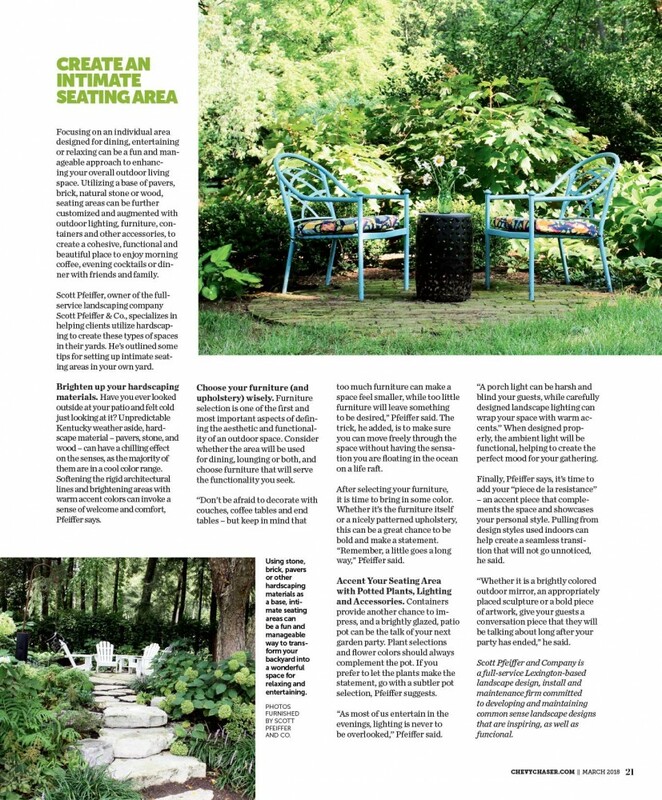 I would rather be in a garden (training, pruning, cleaning, looking, learning….) than anywhere on earth. Ever been stung by a bee? Many, many times over the years, but every once in awhile it will be a hornet instead of a yellow jacket, wasp, or honey bee, and it is mind boggling how much pain they can bring! As a kid, I loved playing __________ outdoors. Lots of perennials, a few annuals, veggies, and herbs. 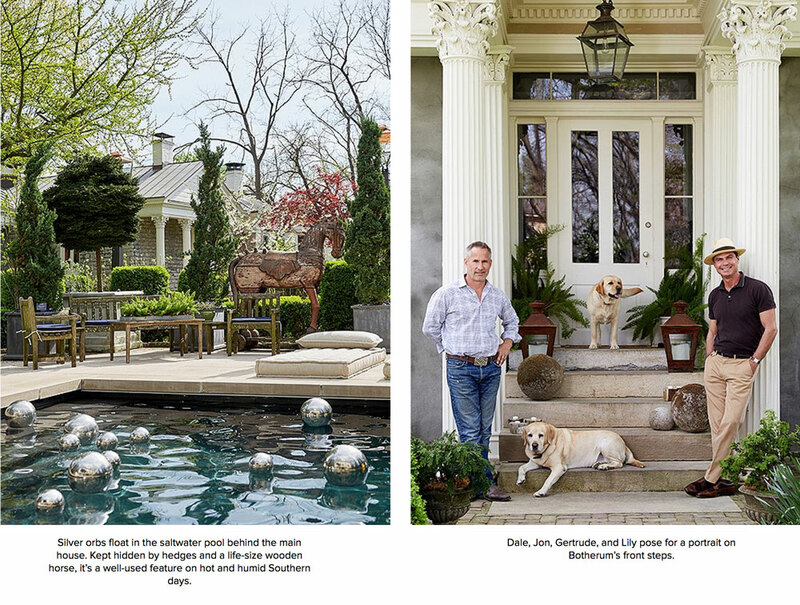 Of course, our 1 acre property is Boxwood World, too! Essential for telling a story, making things exciting for visitors, and a huge part of entertaining in Lexington, KY.
Oh, there have been so many, but the one that still sticks out was telling my Argentine crew who didn’t speak English very well, to put out grass seed (it had been coated with a colored fertilizer) on all the grassy areas and they misunderstood and thought it was granular fertilizer and put it in every border and bed… arghhhhhhhhhhh. Pulled that out for years! Usually the day I’ve spent and think about it before going to sleep at night. Sunglasses, floppy hot, SPF—or all three? Light misty rain when the garden is gorgeous and the plants are happiest. A vista, a seat of some sort to sit and look at the garden, a couple of dogs that are garden friendly and don’t destroy things, some sort of art piece that could be a found object or created by someone, and some structure to get out of the sun. Playing with the dogs and walking through an interesting garden. Making folks excited about being outdoors. There are lots of people who don’t spend any time outside and they do when they come to my garden. Who would you invite to your dream alfresco dinner party? My closest friends, and that happens quite often during the year around our pool. Lots of laughter, cocktails, delicious food, and great views of the garden. Who throws a good party? Heidi Klum, Cindy Crawford and Rande Gerber, Solange Knowles, Reese Witherspoon, Oprah — and Jon Carloftis. It’s a pretty tony crowd, selected after “six months of querying more than 1,000 in-the-know social authorities, including journalists, philanthropists, not-for-profit fundraisers, social luminaries, event planners, and cultural and business leaders from coast to coast,” the site states. 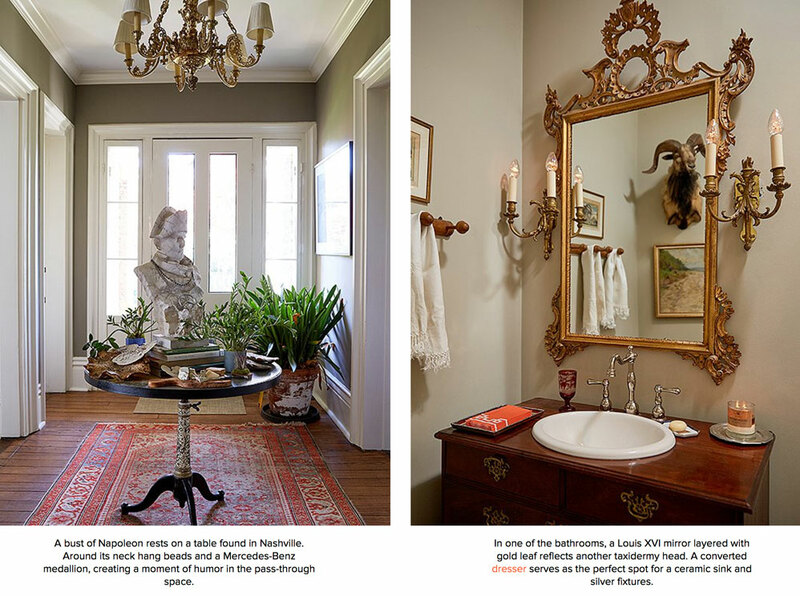 The Salonniere (“sal-on-yair”) is the nation’s leading website dedicated to the art of entertaining. 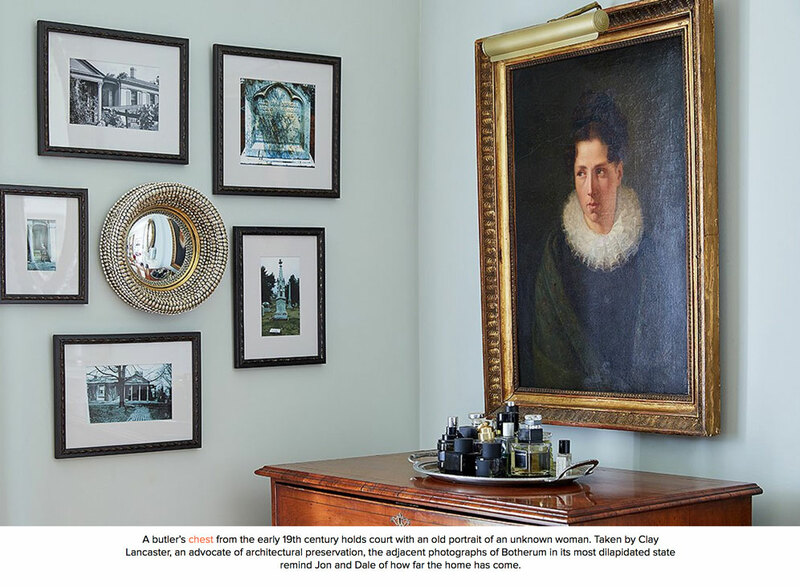 The award-winning site is named for the women in 17th- and 18th-century France whose influential parties — called salons — proved the power of thoughtful social gatherings, the website states. 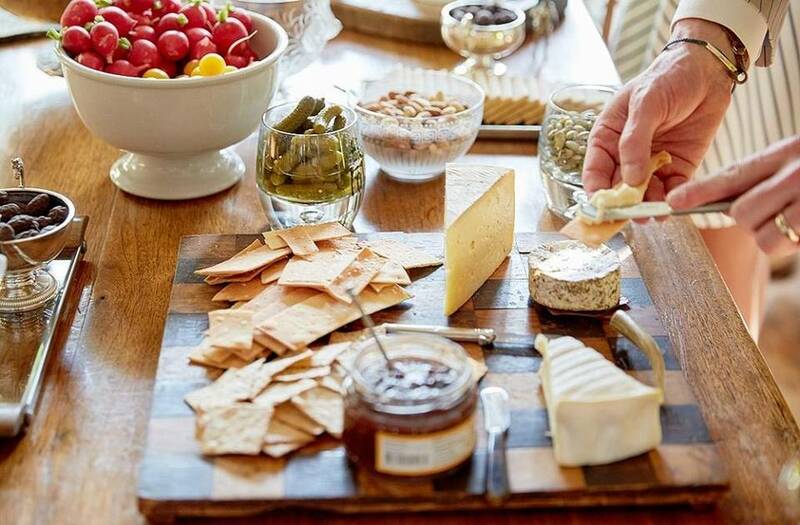 Other Kentuckians on the list: Priscilla Barnstable and Patricia Barnstable-Brown, famous for their annual Kentucky Derby Eve gala, and Tammy York Day and Tonya York Dees, Louisville executives and sisters who also host Derby parties. “Did you see the people on there? Lord, have mercy,” Carloftis said. 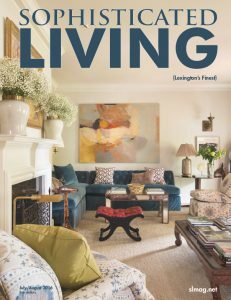 Carloftis and his partner Dale Fisher, who own Botherum in downtown Lexington as well as a home in Bucks County, Pa., and another in Rockcastle County, were selected for their entertaining style. “I plan everything to the last inch days ahead. I make sure that every surface inside and outside the house is pleasing and interesting and that the food and drinks are all set to go. Of course when our guests arrive, I make it seem as though everything has happened by chance, at the last moment, and then I take them on a magic carpet ride for the night,” Carloftis told the magazine. Another key: what they do with their social capital. 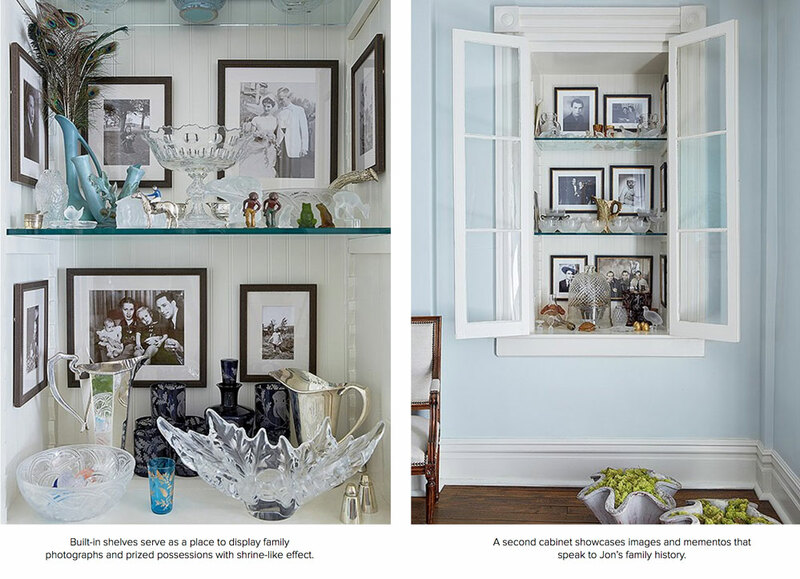 Carloftis and Fisher bought the historic home six years ago and, after a year of renovation, opened it to events. “This is not a public place, but we have opened it up to so many groups … and we’ve raised over $2 million for people with Botherum,” Carloftis said. 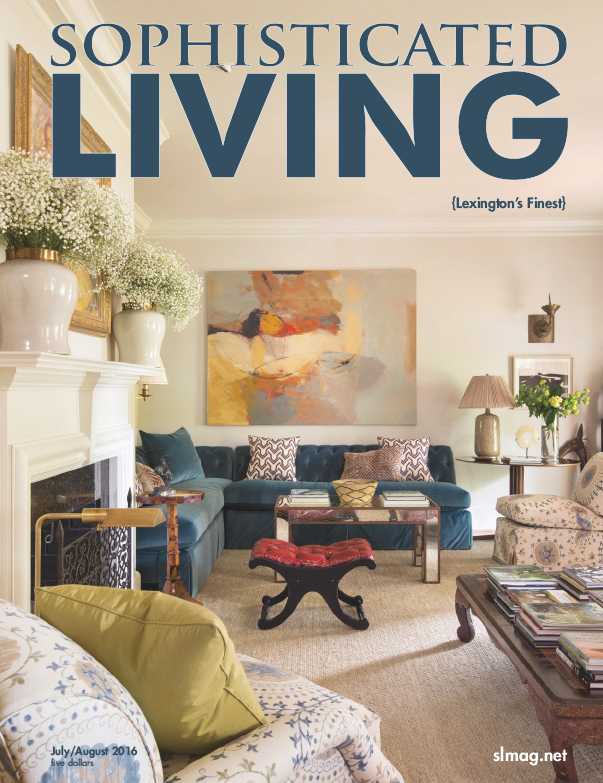 Here’s how much in demand they are: They put a Botherum party up for auction at the annual Lexington Cancer Foundation Wine Auction, a benefit at Donamire Farm. “The first year it went for $35,000 and the second for $155,000,” Carloftis said. 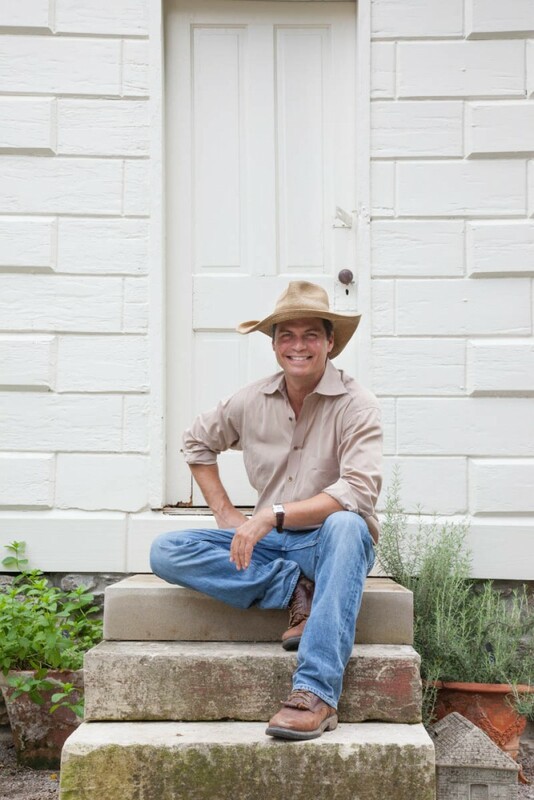 But Carloftis said their philanthropic entertaining will have to slow down a bit because he’s got several major projects coming to fruition, including the opening of the new Lux Row distillery in Bardstown, which he landscaped. And the Bulleit Distillery in Shelbyville that he is landscaping. And the Castle & Key Distillery in Woodford County … and the Maker’s Mark Distillery outside Bardstown … and on and on. “Daddy’s got to work,” he said. 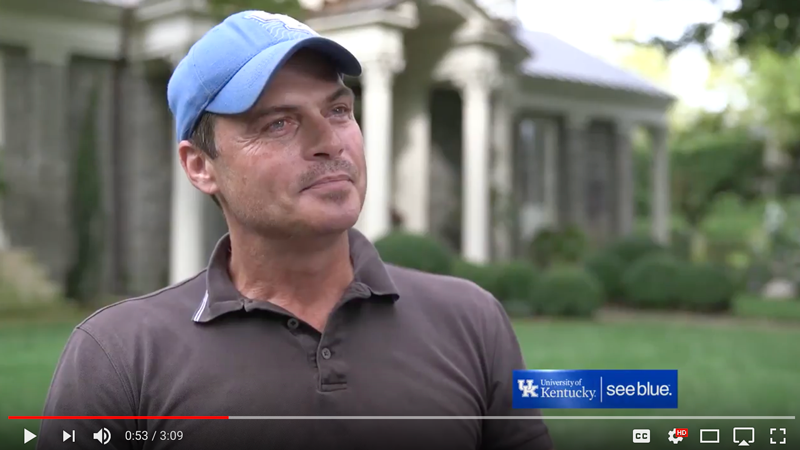 He said they work with Mary Quinn Ramer of VisitLex, restaurant owners such as Debbie Long of Dudley’s on Short to do a dinner and then tap their distillery and horse farm connections. “We had the Tuckahoe Women’s Club from Richmond, Virginia, come, and in three days, they spent over $50,000 in local economy,” Carloftis said. A busload from the club enjoyed a private room at Keeneland’s clubhouse for a day at the races, visited a beautiful horse farm, saw lovely gardens big and small. “We do a cocktail party here for them … we have the music on, the candles are lit and we entertain them in the garden, and it’s a trip they never will forget,” he said. 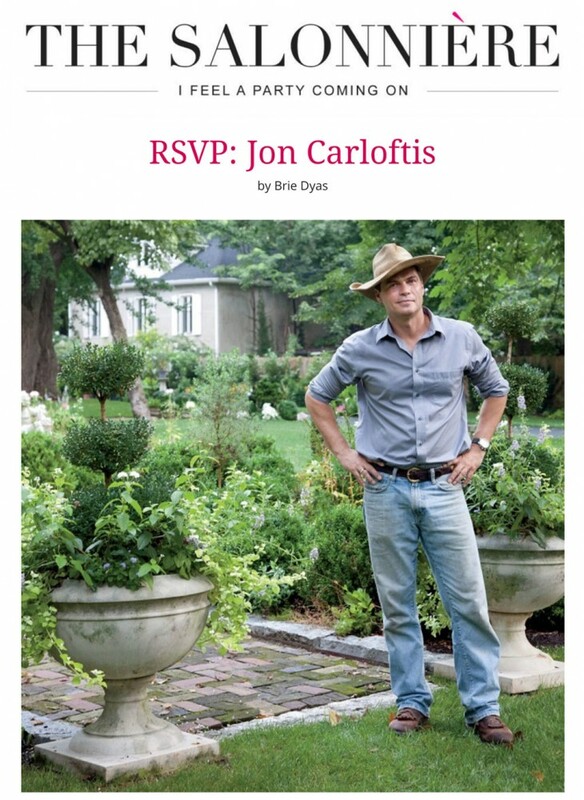 Want to throw a party like Jon Carloftis? 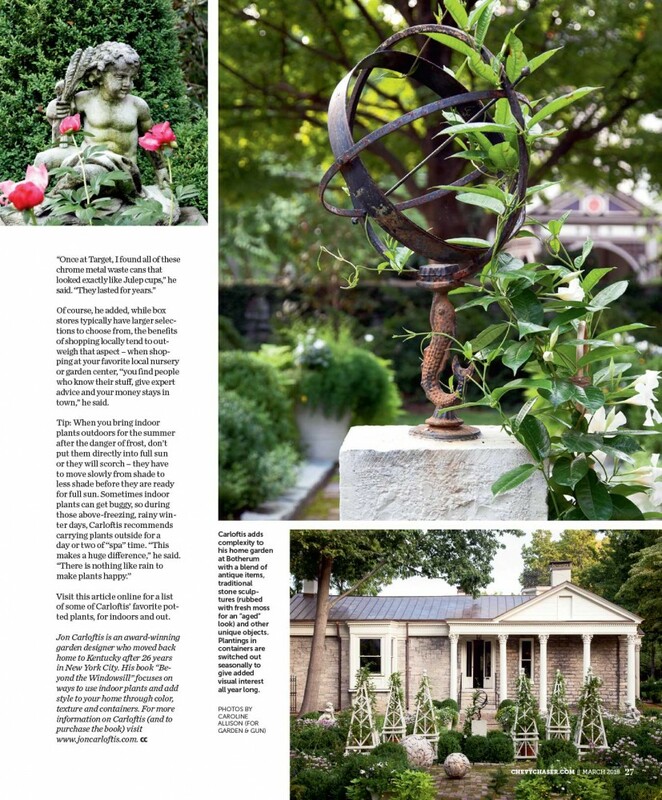 While lush with plantings during warm weather months, the garden at Botherum – the historic Lexington home of landscape designer Jon Carloftis, pictured here –illustrates lots of other ways to enhance an outdoor living space, from paths and walkways to sculptures, container gardens, seating areas and more. March tends to be that month where we Kentuckians start to get the first real teasings of springtime: Green buds are popping up in the dirt, temperatures are slowly rising, garden centers are reopening. But still being a couple months away from the last danger of frost, it really is just that – a tease – for gardeners who are anxious to whip their yards into shape. Rest assured, it’s a great time of year to get started on plenty of projects, large and small. 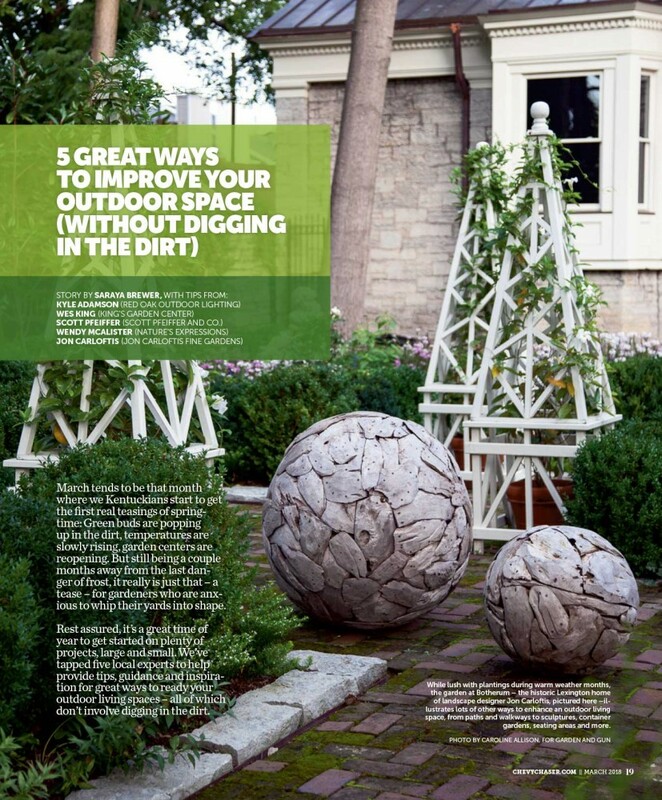 We’ve tapped five local experts to help provide tips, guidance and inspiration for great ways to ready your outdoor living spaces – all of which don’t involve digging in the dirt. Cast stone fountains, such as these from Campania International, can be a great option for those looking for more a significant visual and aural statement. 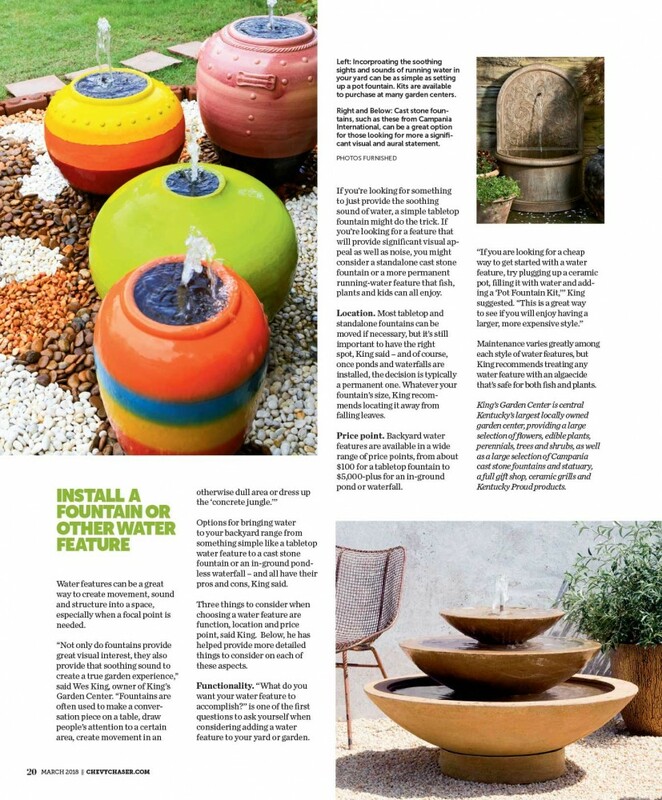 Incorporating the soothing sights and sounds of running water in your yard can be as simple as setting up a pot fountain. Kits are available to purchase at many garden centers. Water features can be a great way to create movement, sound and structure into a space, especially when a focal point is needed. 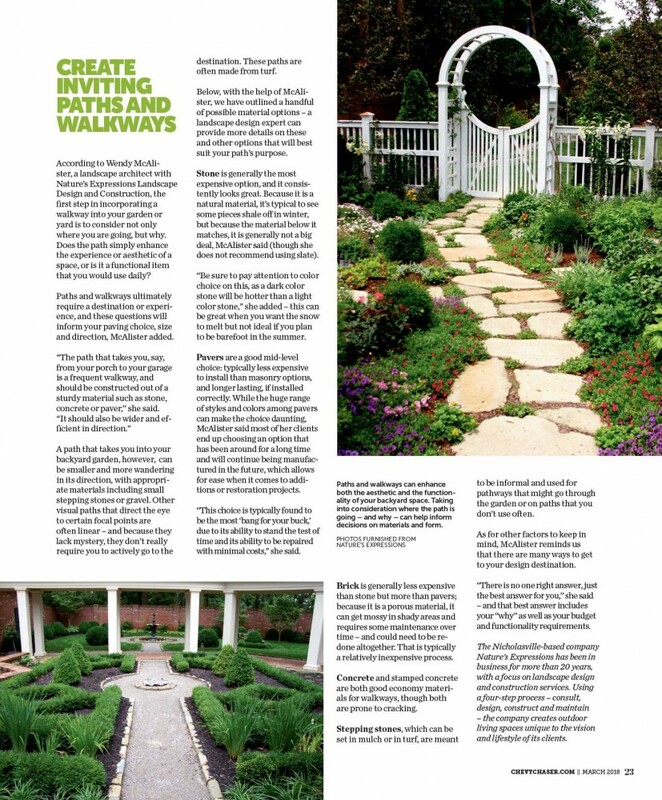 Options for bringing water to your backyard range from something simple like a tabletop water feature to a cast stone fountain or an in-ground pondless waterfall – and all have their pros and cons, King said. 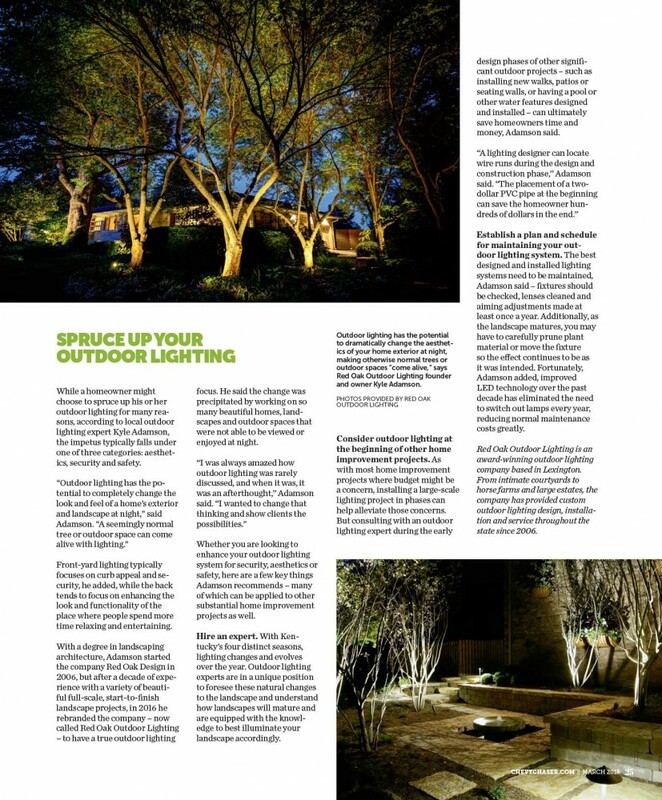 Three things to consider when choosing a water feature are function, location and price point, said King. Below, he has helped provide more detailed things to consider on each of these aspects. To read more, visit smileypete.com/community/exterior-decorating or click on the thumbnails to view full article. 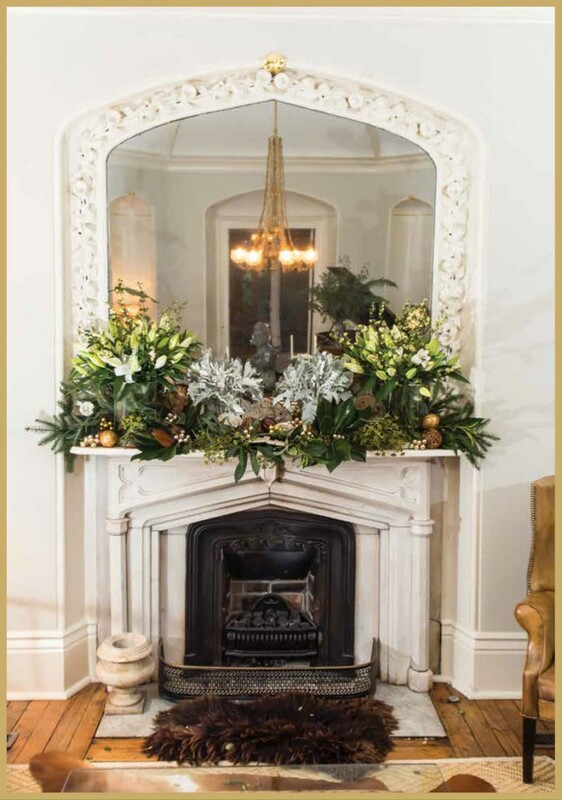 We welcomed Abby Laub of Kentucky Monthly at Botherum to give their readers our tips on dressing up their mantels for the holidays. 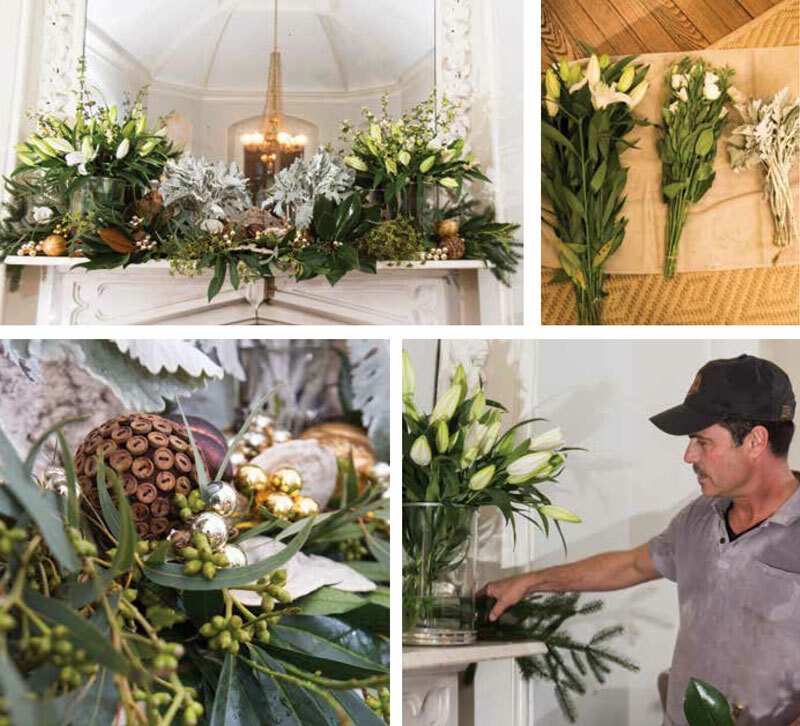 With a simple trip through the backyard, we gathered freshly cut Southern magnolia, skip laurel and Norway spruce and arranged them on the mantel. 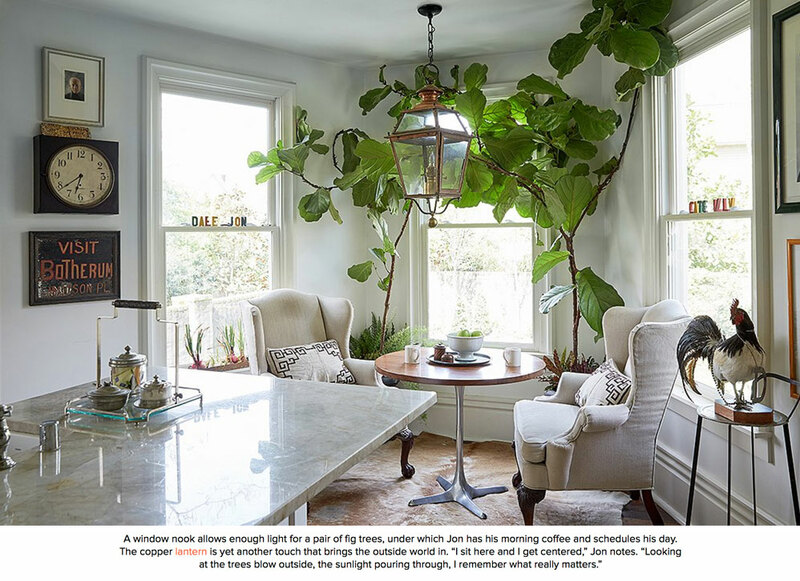 Adding bits of holiday colors like golds and browns and whites, some flowers here, some ornaments there… you can create a breathtaking center piece for you room! My family bought 50 acres along Rockcastle River in Kentucky back in 1955. This is where I grew up. The Daniel Boone National Forest was my backyard, and our closest neighbors were 4 miles one direction and 2 miles the other. My childhood was wild—my brothers and sisters and I spent a lot of time in the woods exploring. I remember being mesmerized by a tree that grew in the shady forests there. 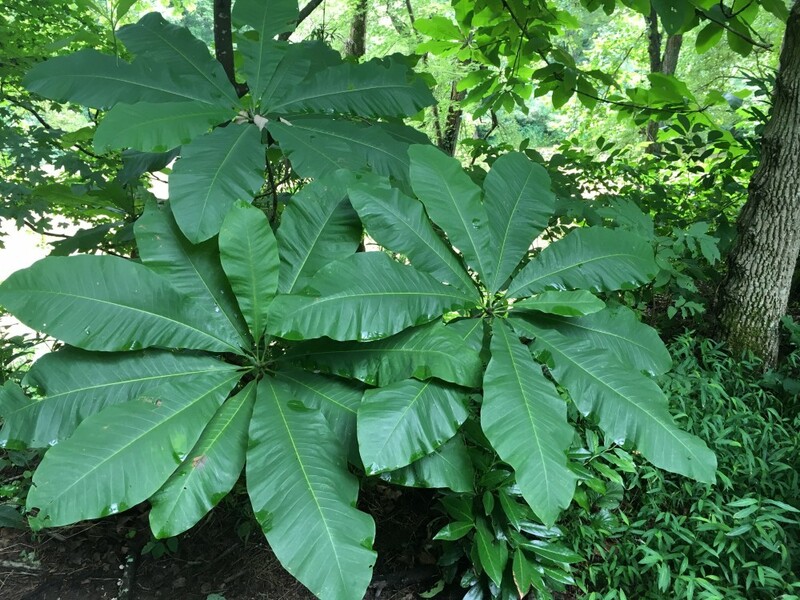 It had enormous leaves that would reach 2 or 3 feet long. We’d use the leaves as body armor and pretend we were Cleopatra’s henchmen. Later, I found out this tree was Magnolia macrophylla. It’s still my favorite tree. It’s native to North America, has large creamy white flowers in summer, and in fall it gets these reddish orange conelike fruits that look prehistoric. I’d plant it just for the leaves but it has all these other wonderful qualities, too. 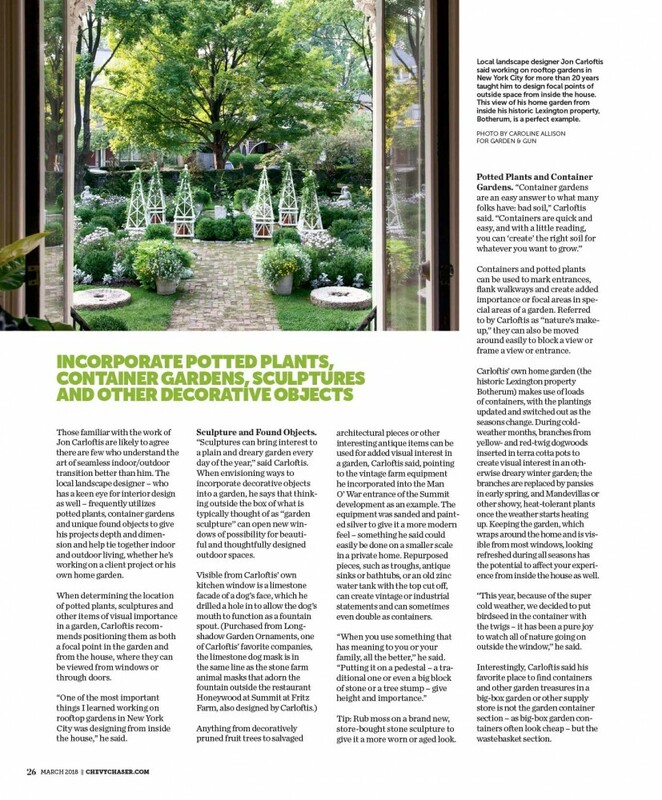 To read the rest of the article, pick up your copy of Garden Design Magazine on the news stands now! Recently, the University of Kentucky put a piece together for their website about my work and being an Alumni of UK. It was a great way for me to share how UK influenced my career and changed my life. I was also humbled and excited to find out that they would be honoring me for my work during half time of the football game this Saturday, September 9th. Folks, I can’t imagine my life without having attended UK. I was the youngest of 6 and most of us attended small private colleges. It was quite a daunting moment when I decided to go to a university as large as UK. But I loved everything about it! I met so many people from so many places, forever changing my outlook on life. If you’re around on September 9th, please come support the Wildcats when they play EKU on Saturday at Kroger Field. Kick off is at 12PM! 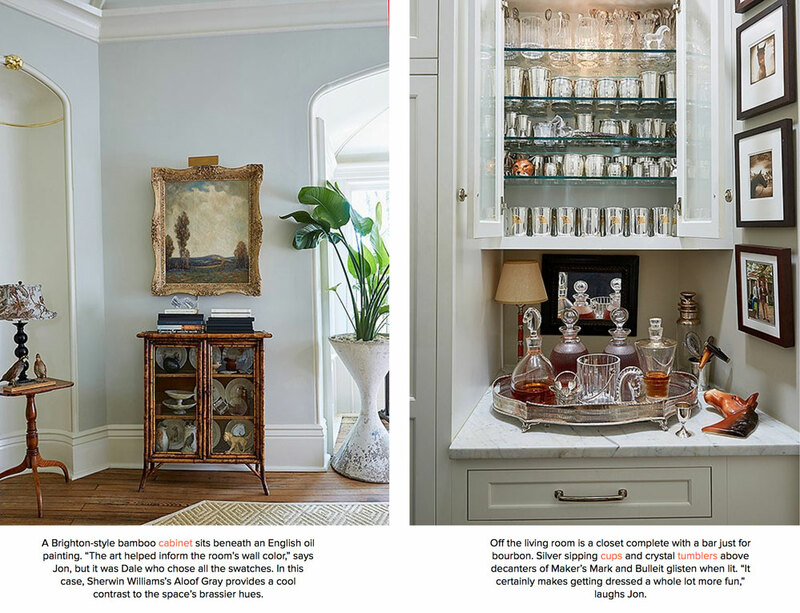 Recently I had the pleasure of speaking with Brie Dyas of The Salonnière who asked me about all the things I love most… the history of our home, Botherum, my preferred way to entertain at home, tips for creating a great outdoor entertaining space, and about some of my favorites (like florists, caterers, dinnerware, shops) in and around my home city, Lexington… She’s put together a wonderful article that I hope you enjoy! 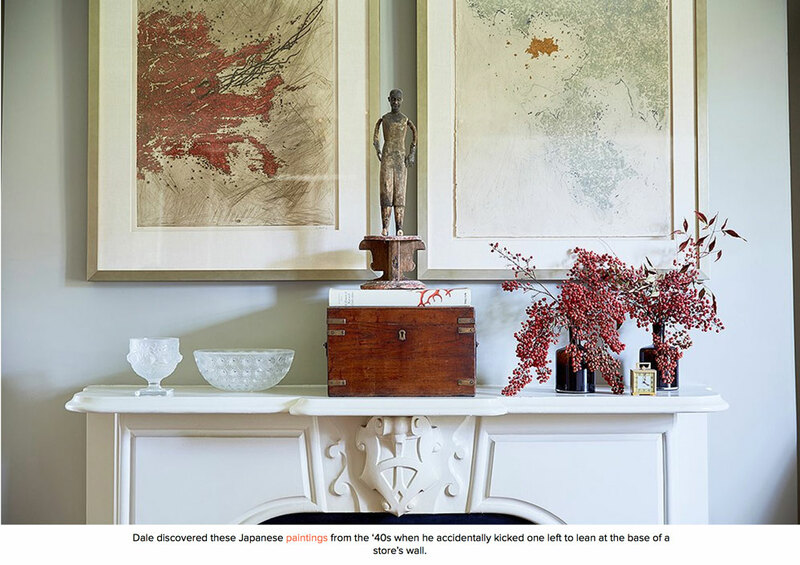 The following is the full article, but please check out onekingslane.com for links to some really great decorating ideas, all based on the styles found in Botherum. 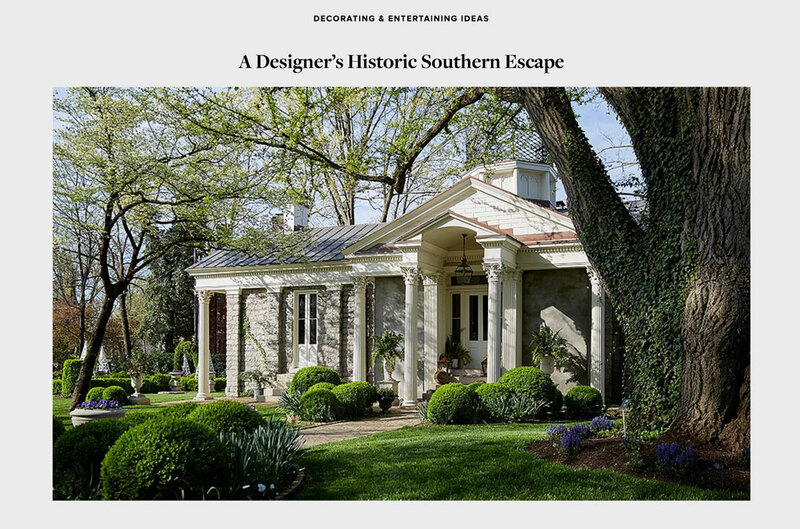 Beneath a magnificent ginkgo stands a Greek Revival home surrounded by mowed grass, hedged boxwoods, and a limestone wall separating it from a neighborhood of Victorians just beyond. Fast asleep on its gated drive are Gertrude and Lily, two yellow Labradors who, if prompted, rush to greet all who enter the compound known as Historic Botherum. 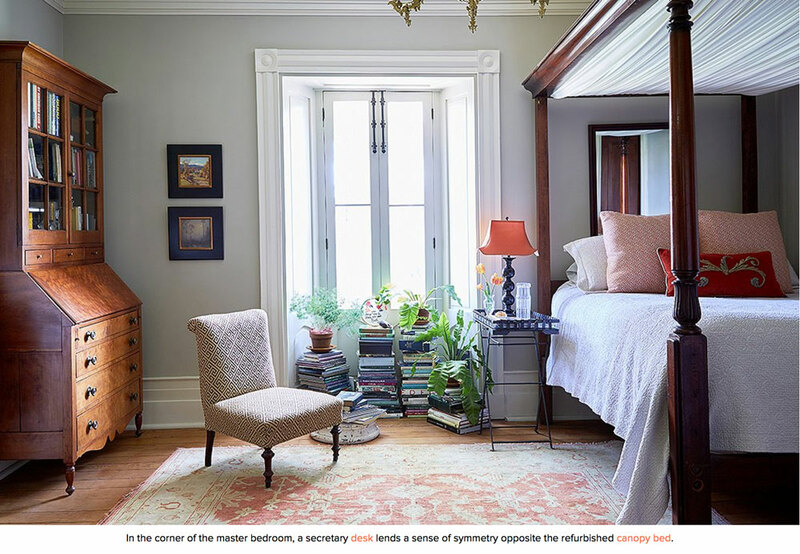 A Lincoln-era property situated in the heart of Lexington, Kentucky, it belongs to landscape designer Jon Carloftis and his partner, Dale Fisher. 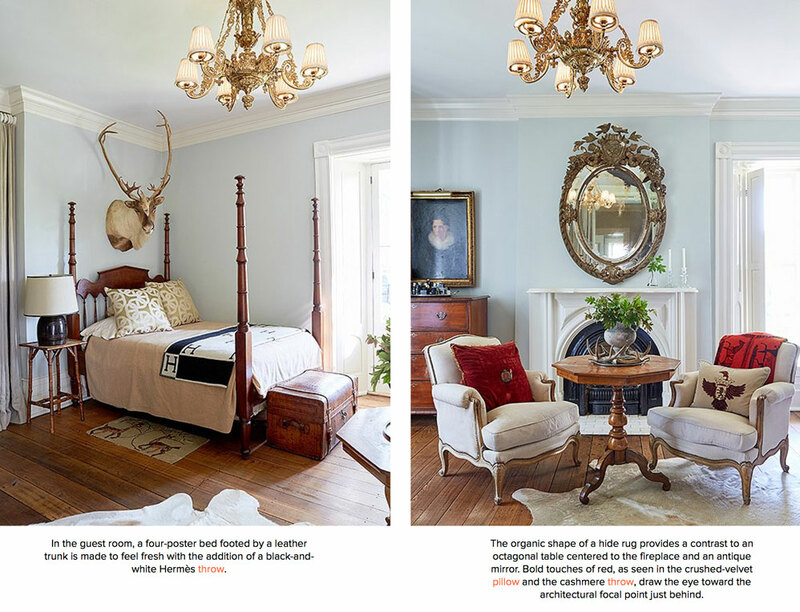 During the past five years, they’ve worked as a team to restore the home and its surrounding grounds to a contemporary version of its former glory. 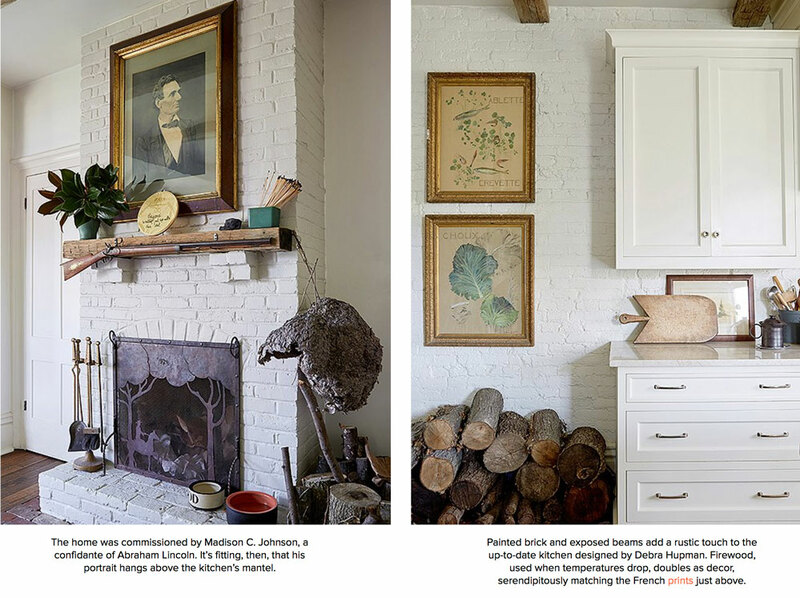 “We wanted to preserve as much of it as we could,” says Jon. 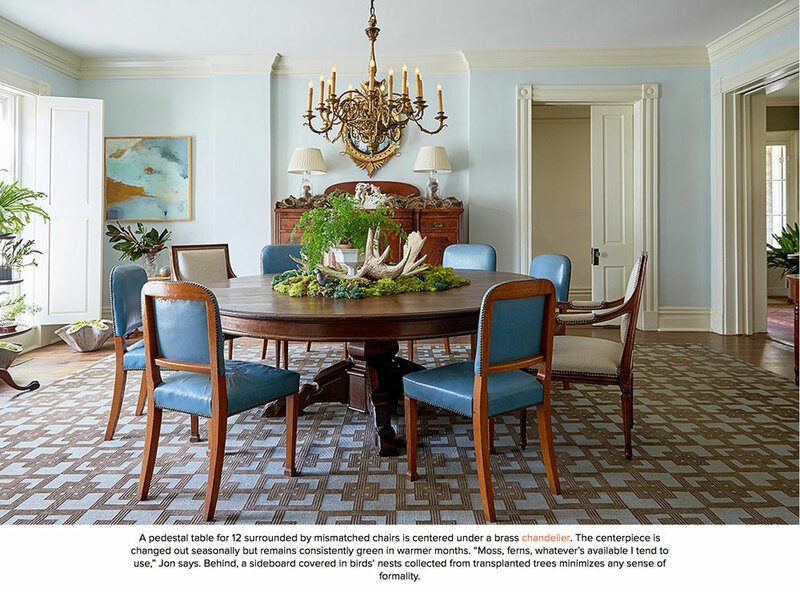 “We didn’t want to ruin what was already in play with a full-on renovation.” And so floors were buffed and topped with five coats of tung oil, fixtures were taken out, polished, and reinstalled, and the existing layout was maintained. Of course, there were a few exceptions—enhancements, rather, made in the interest of Southern comfort. A saltwater pool wasn’t included in the original plans, but one was added, albeit carefully screened by a period-appropriate plantscape. Claw-foot tubs? None here. Jon prefers showers to soaks and felt no need to indulge in antiquated frivolities. “It’s not like we’re living in a museum,” he laughs. 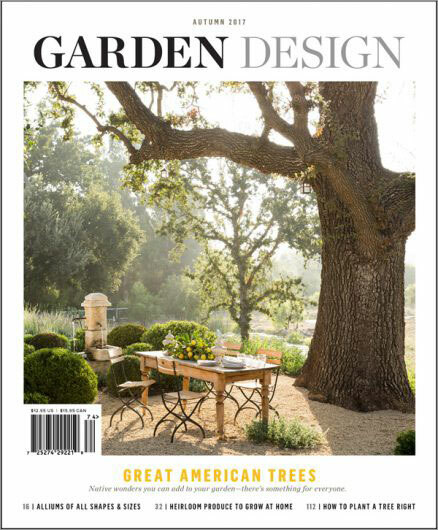 This was a project we started almost 20 years ago, but we just updated of the whole garden, keeping almost the same varieties of trees but dwarf varieties that never need pruning like before. These weren’t available back then, but we were excited to use them here. 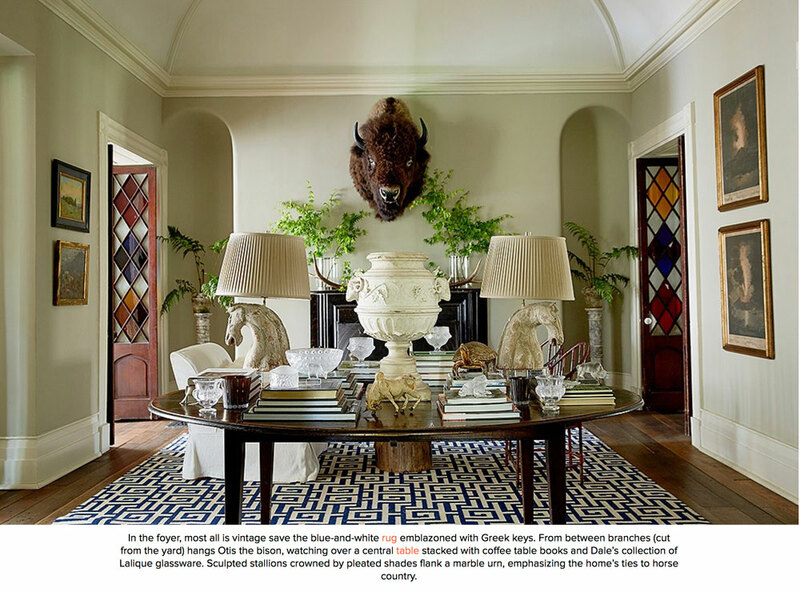 Interior designer Matthew Carter did the inside of the house and it’s perfectly gorgeous. 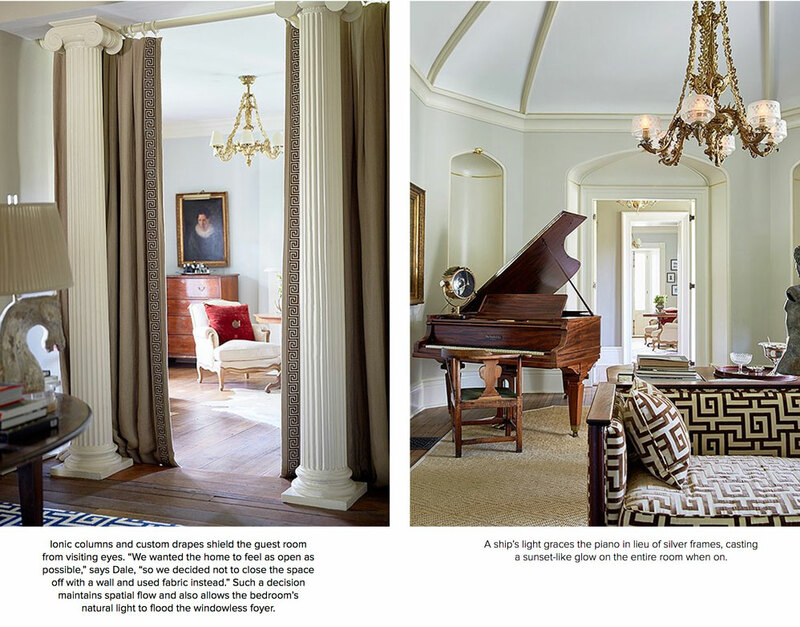 Check out the entire article in the July-August issue of Sophisticated Living! 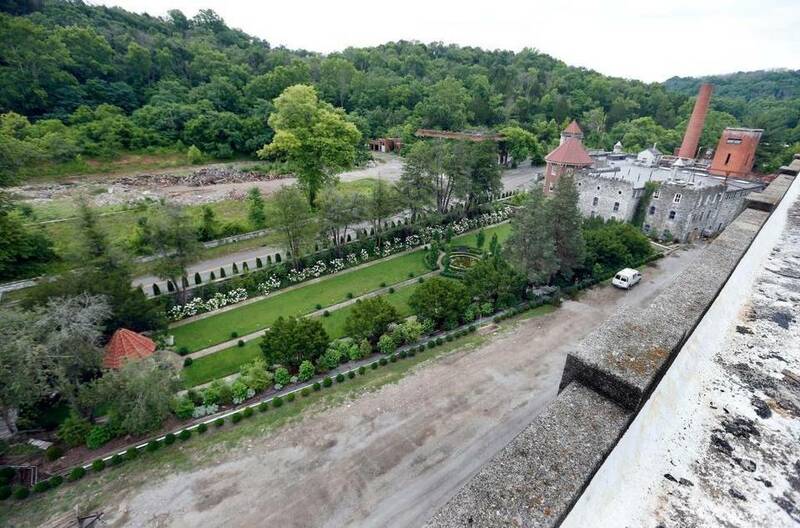 Great article in the Herald-Leader about the former Old Taylor distillery, now called Castle & Key. We have been remaking the famed sunken garden, a unique feature designed by Col. E.H. Taylor Jr. specifically for the tourists whom he would bring in on private trains. The garden is again a showplace and already has been the backdrop for a wedding. The rest of the grounds have been transformed into a botanical trail and, in the remnants of the first warehouse, a botanical cutting garden, which master distiller Marianne Barnes plans to use for botanical gin recipes.